How were students recruited to St. Norbert College in the early days? Thank you for this inquiry! As I ponder this thought, I realize how much more sophisticated we have become in such endeavors since our first student, Francis Van Dyke, entered as a young man eager to begin a journey that would culminate in his ordination to the priesthood. Two weeks later, along came Anthony Vissers. These two enterprising youngsters took matters in their own hands when they decided to head our very first recruitment effort. Their methods were somewhat unorthodox even by the standards of the day; dear me, I recall they actually hauled their friend and soon-to-be-classmate Charles Savageau through the window into the room in which our classes were held! It wasn’t long after that W.C. Marchant joined us, and we became a school of four. No more than a year or two later, we were beginning to make use of print in order to more formally advertise our school to the public. I believe our very first advertisement must have been the one we placed in Wright’s De Pere Directory of 1901-02 offering instruction in “Classics, Modern Languages and All the Usual Branches.” Indeed, am really most indebted to my dear colleague Professor Victoria Tashjian, of our history discipline, for unearthing this long-forgotten publication from a local archive. 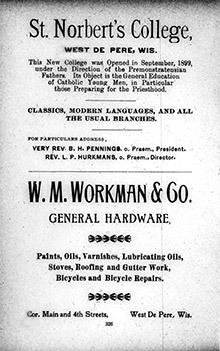 By no means could I, or my Norbertine confreres of old, imagine the number of tools that are laid at our disposal today for the purposes of advertising! As my readers may know, the recruitment efforts of today are quite different, and described using terms I can barely comprehend – “electronic communications,” “social media” and the like. I don’t believe my friends in the office of admission would consider as a tactic reaching out to any of today’s young men or women through a window! I do, though, truly hope my readers consider sharing their own stories of St. Norbert College with young women and men who would benefit from just such a fine education as we offer. It gives me such pleasure to reflect that many of you share just as much passion for our college as did my first four students! Could this be the very first advertsiment for St. Norbert College? It was placed in the 1901-02 edition of Wright's De Pere Directory – published just three years after the college's founding.